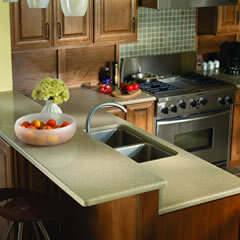 The strength of a quartz countertop can make it easier to install and handle. In fact, installing a quartz countertop will require the same techniques and skills as granite. For instance, seams in a quartz countertop are barely noticeable mainly because this surface is more consistent when compared to granite. However, if you are planning to have your quartz countertop installed, you should consider the fact that this material weights more than granite and you should better hire a licensed professional in order to have it installed unless you have some experience working with such a countertop. If you buy your quartz countertop from a reputable dealer, they are very likely to provide its installation as well, as part of your purchase. Also, hiring a professional to do the job will cost you less in terms of future broken slabs and waste. But if you do decide to install the quartz countertop yourself, you should pay attention to the following tips in order to avoid making any costly mistakes. Make sure that you cut and install your quartz countertop only after you have determined the exact design and color you want to have for it. The main things you are going to need are painter’s tape, silicone sealant, diamond blade, tape measure, circular saw, level and construction adhesive. Start by measuring the exact width of your quartz countertop – use the tape measure in order to do this and determine how much from your countertop needs to be trimmed at its end. Next, you will have to place the painter’s tape along the whole width of the quartz countertop in order to mark the exact places where you are going to cut this surface. Attaching the diamond blade to your circular saw is what comes next – plug this saw right into the electrical outlet. Then, start the saw and have it pushed right into the quartz countertop. Next, you will have to spray the entire saw blade and your quartz countertop with some water in order to reduce dust and heat. Next, you will have to push through this surface while spraying the saw blade with water – do this until you have managed to cut through the entire surface. Then, you will have to place your quartz countertop on a base cabinet or on your kitchen counter in order to see how this surface will fit. Next, you will have to apply some construction adhesive right to the top of your kitchen counter. Set the quartz surface in place and place the level on it in order to check for level. Next, you will have to apply the silicone sealer right to the back of your backsplash. Set it in its place against the kitchen wall. Keep in mind that it’s advisable for you to have a second person with you in order to spray all the necessary water right on the diamond blade and to help you set the quartz countertop in place. Also, level is highly indicated especially when the bubble is right between the parallel lines.